Vayyar's sensor can also monitor your breathing and could be used to detect breast cancer. 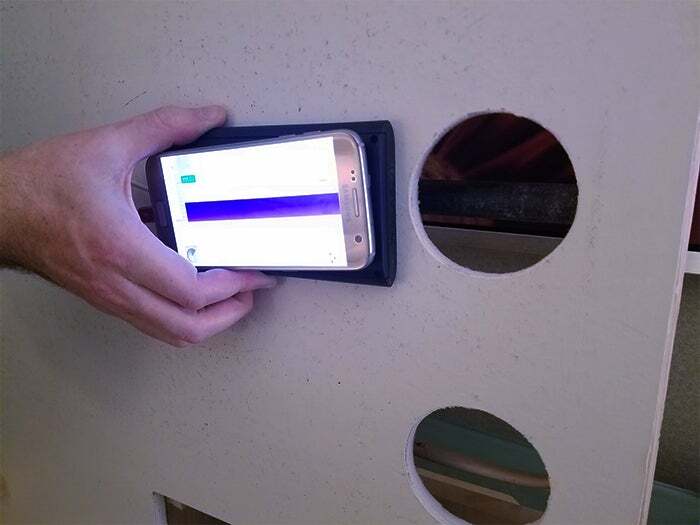 A Vayyar employee uses Walabot to scan a demonstration wall for pipes. With an HTC Vive strapped to my head, I looked toward a wall in the hotel room and saw a person-shaped image. Back in reality, a Vayyar employee was stepping side to side in the bathroom. I was able to track his movements from the other room. To put it bluntly, I was seeing through walls. Out of all the things I saw at CES, Vayyar's technology may be the most impactful. The Israeli company's sensors use radio frequency signals to create 3-D scans. As the electromagnetic waves bounce off an object, it creates the data for the sensor. 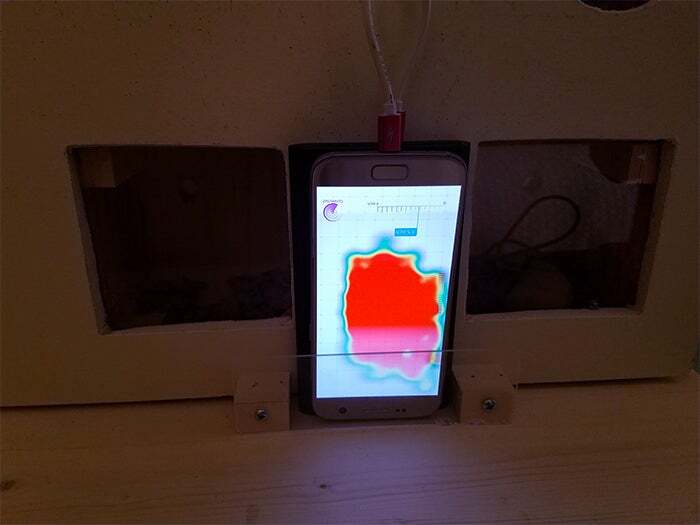 For example, the company used its 3-D imaging sensor Walabot to scan a demonstration wall. As the phone-like device was slowly swept side to side, an image on a nearby screen showed where the pipes hidden behind it were. It could also see inside the wall as a mouse ran from one side to the other. That's useful for construction and pest extermination. Vayyar's Walabot can detect pipes in walls. The technology was originally developed as a safer, less intrusive and relatively inexpensive way to detect cancerous tissue in breasts. "This device will change a lot," said Raviv Melamed, Vayyar's founder and CEO. "We were going for this one thing and we realized it could be used for much more. That's unique for a startup. Usually they go in one direction." Vayyar holds patents for its technology and plans to make money off licensing it. It also sells its sensor chips to other companies -- about 200 have bought it so far -- who will install them in their products. The company has partnered with Samsung and other large companies, but those deals are under wraps, said Melamed, who previously worked with radars in the Israel Defense Forces and later at Intel's wireless division. "What Qualcomm did with cellular, we want to do with imaging," he said. The company, which employs 50 people and has raised $34 million, plans to focus on smart home technology this year. That includes security, elder care and health monitoring. Another demonstration I witnessed was a Vayyar employee go from standing to lying on the bathroom floor. A sensor on the wall immediately started beeping. As Melamed points out, this is a way to have peace of mind as older people take showers while protecting their privacy, because there's no camera. Vayyar's Walabot can detect live creatures in walls, such as this demonstration rat. In another test, I laid on a bed while a sensor hung from the ceiling. I was told to breath normally, which was visible on a nearby monitor. I then drew a deep breath and held it, which caused my image on the monitor to disappear. Vayyar said its sensor, which detects the tiny movements of the lungs, could be used to diagnose sleep apnea. A cleaning robot connected to a Vayyar sensor was able to detect the difference between a door frame and a cable. When it encountered the latter, the robot knew not to go any further. While Vayyar had all the aforementioned uses on display for me, the company has put its technology out to the maker community to find even more uses for its sensor. One of those suggested uses was for fisherman to scan their catches for eggs (which can be made into caviar). This approach goes hand in hand with Melamed's top advice for entrepreneurs. "I like to take a lot of advice," he says. "Talk to as many people as you can and understand pitfalls so you don't to go through them yourself -- and stay humble."